A new month means only one thing... A new Beauty Heroes box of course. This month's expert selection is worth $118 and could all be yours for only $39 (shipping worldwide) so what's the brand? Well. It's a good one. True Nature Botanicals! And the product? Their cult classic Exfoliating Moisture Mask ($90) and a deluxe sized sample of their original face oil ($28). TNB is one of my all-time favourite brands and they've been featured countless times on the blog. The Exfoliating Moisture Mask is deceptively small but mighty. Green and white tea, lactic acid and mango butter combine to hydrate, refine and brighten skin, you only need the thinnest layer for 5-10 minutes to see a serious difference. This mask is powerful. Get the box. Moss has just launched a new, more gentle version of their best selling spot treatment Zen Physic. Zen Doux is it's gentler sister, with fewer essential oils for sensitive skin but still as potent for healing acne. ILIA have launched their spring collection recently too, featuring a radiant beauty balm, SPF powder and two tinted lip conditioners with SPF. I'm really interested in the new brand Kiki Health that has just launched, I love me some superfoods. I especially want to try their aloe vera juice and magnesium oil spray. Plus any purchase over £20 receives a free Nature's Living Superfood (20g). Finally, SkinOwl's latest release Neck + has launched exclusively on Cult Beauty (with free delivery worldwide) I haven't seen many, if any green products specifically for the neck so I'm interested to hear more about this. As always Content have been busy discovering new british beauty brands for us and their two latest brand launches are Amly and Supernatural Beauty (who you should already be familiar with if you're a regular reader!). 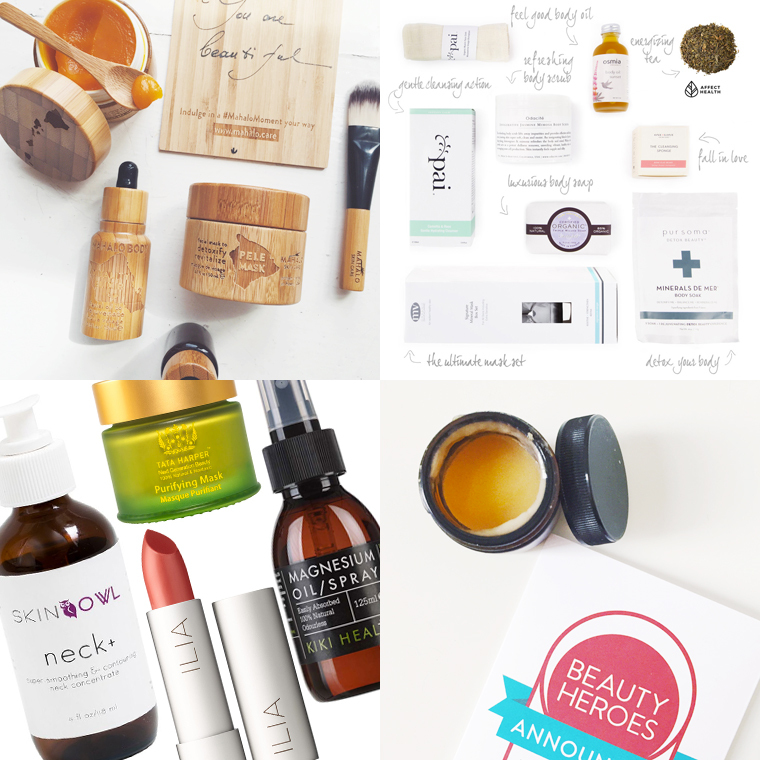 The lovely folks over at the Detox Market have just released their spring box, and it's pretty epic! The box contains 8 full size items, is super limited edition and costs $129, but is valued at $230 if you were to buy everything separate! Finally! More new beauty bits to wet your whistle. This time from Naturisimo. Lily Lolo's Sculpt & Glow kit looks like a great way to start learning the art of the contour. Kure Bazaar have some new spring shades out. This new tea brand Bloom looks beautiful. and many, many more. Plus spend £35 and use the code "SATORI" to recieve a sample vial of Lina Hanson's Satori perfume (this sample usually costs £9! ).